Base price per 100ml: 18,31 €. Immediately available! Delivery time 2-5 Days. It is valid for deliveries within Germany, for the delivery times of other countries please follow the link with dispatch information. Aloe Barbadensis Leaf Juice (Stabilized Aloe Vera Gel), Water, Propanediol, Sorbitol, 1,2-Hexanediol, Chondrus Crispus Extract, Sodium Hyaluronate, Glycerin, Cucumis Sativus (Cucumber) Fruit Extract, Camellia Sinensis Leaf Extract, Beta Glucan, Sodium Lactate, Phytic Acid, Allantoin, Potassium Sorbate. Directions:Apply a generous amount to face and neck after cleansing using a cotton ball or pad. Use twice daily to minimize the appearance of pores and hydrate skin. Caution:Avoid contact with eyes. In case of eye irritation, rinse thoroughly with water. If irritation persists, discontinue use and consult a physician. Does your skin need something extra after cleansing? Ensure all dirt and debris were washed off, minimize apperance of pores and add extra hydration by applying balancing toner between cleansing and moisturizing. 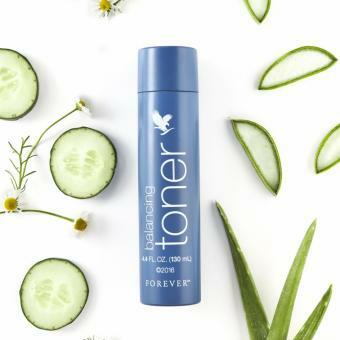 Balancing toner provides a unique blend of seaweed extract and sodium hyaluronate. When combined, these powerful ingredients moisturize and soften your skin to support youthful looking skin.We have added cucumber extract to soothe and provide additional hydration. Cucumbers may improve your skin’s tone and it also contains ligans which may help with your skin’s texture and puffiness. White tea extract is a rich antioxidant with high polyphenolic content that works with a high concentration of aloe to balance the fluctuations of the skin and help fight against free radicals. To further super-charge this powerful formula, we used hyaluronic acid, which has been called a “molecular sponge” thanks to its water attracting properties. Adding balancing toner to your skincare routine will make a pronounced difference in your skin’s feel as well as appearance and help support the absorption of additional nutrients applied to your skin. Aloe Vera Facial Care Set, infinite by Forever™ 553, 4 pcs.